New! : The Oberlin Heritage Center is now selling Apollo Theater T-Shirts in their Museum Store and online. Stop in to see one and support local preservation with your purchase! 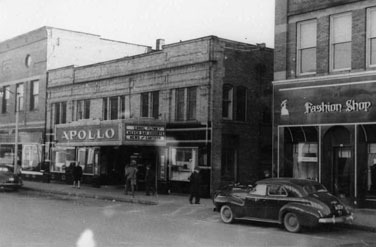 Oberlin College became the owner of the Apollo Theater on February 27th and announced plans to renovate the building and to continue to operate it as a movie theater. At a public forum on February 27th, the College stated that the theater would be converted to a multiplex and that changes to the façade were planned. We were delighted to read Oberlin College President Marvin Krislov’s column in the online Oberlin College publication The Source on March 11th which clarified that the College does not wish to split the Apollo’s main room into multiple screens and that they do plan to continue the single screen theater as long as it is economically viable. 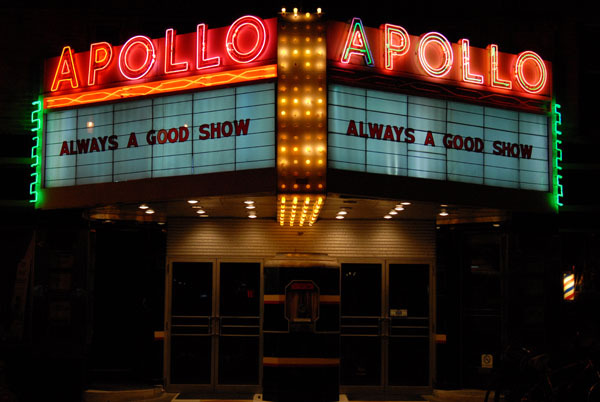 He also stated that there are no plans to make significant changes to the Apollo’s façade or marquee. Various needed repairs and safety and accessibility upgrades are being planned. He invites the community’s input, support and creative ideas for the project. The Oberlin Heritage Center Board President James White wrote a letter to College President Marvin Krislov and Sandra Hodge, Special Assistant for Community and Government Relations on March 11 to encourage the College to renovate the theater in a way that will preserve its special sense of place and authenticity and also encourage the College to preserve the theater’s significant interior and architectural elements, including its magnificent Streamlined Moderne façade and marquee. Mr. White also encouraged the College and its architects to adhere to the Secretary of the Interior’s Standards for Rehabilitation in preserving this historic resource. Oberlin Heritage Center Executive Director Pat Murphy agreed to serve on the College’s Apollo Advisory Committee and will be advocating for thoughtful preservation of the building’s significant features and its continued use as a single screen movie theater. The Oberlin Heritage Center wishes to expand its knowledge and research and photographic files on the history and architecture of the theater. If you have photographs or documents on the theater that you would be willing to donate or let us borrow, or a memory of it you would like to write up and share, please contact Prue Richards at history@oberlinheritage.orgor Pat Murphy at patm@oberlinheritage.org or give us a call at 440-774-1700. We are planning a future program and online exhibit on the history of the Apollo. We are grateful to the Steel family for operating the theater for so many years. We are very glad that they participated in an oral history interview and allowed volunteers to do a video-taped tour of the theater in the past few years. A group of Apollo Theater fans from the college, community and Oberlin Heritage Center are encouraging the college to maintain the single-screen theater and preserve the existing façade and marquee. They also hope the college will retain the building's store fronts for use as retail establishments which would help keep downtown alive and also offset the costs of operating the theater. P.S. Check out the National Trust's website at www.preservationnation.org.